Demand for faster and more convenient payments is driving the race for new payment technologies. 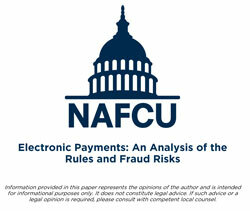 This free whitepaper, created by the NAFCU Compliance Team, will help you understand how this trend away from paper and face-to-face interactions can impact your regulatory and contractual responsibilities. Especially in the face of fraud, which continues to be a supervisory priority for NCUA. We'll cover Regulation E's and Regulation Z's unauthorized use response requirements, the recent changes to Regulation CC, Phase 3 of Same Day ACH, and more. Please fill out your information to download the whitepaper now. Interested in seeing more? Tell us about yourself to get full access.